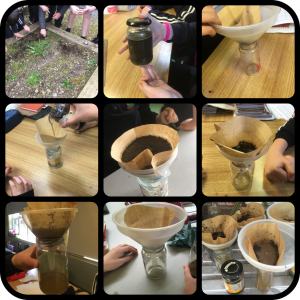 Last week in sixth class we watched a video on water filtration and it inspired us to do an experiment in groups on water filtration for World Water Day. We went to the organic garden and half filled jars with clay. We then added water to the jars and mixed the clay and water together. We placed a coffee filter into a funnel which we placed on a fresh jar and then we emptied the dirty water into the coffee filter. The water started to seep slowly through the filter into the new jar, so we left the experiment overnight to see what would happen. The water that had been filtered was cloudy, but more clear than it was at the start. The majority of the clay had remained in the filter. We decided that even the cleanest of the water that had been filtered would still not be fit to drink. We thought that chemicals should probably be added to the water to make it drinkable. We then tested putting the water through another clean filter to see if the water would become less cloudy. The majority of the class then predicted that the water would remain the same. The water filtered faster than previously but it still remained cloudy and undrinkable.